This is a follow-up to my last post about the use of built-in accessibility features to control an iPad or other iOS device. Any iOS device that is running the most recent software update can be set up to be accessed now with a switch … or through built-in methods involving the device’s screen … or by using the integrated camera, which is what this post will address. Next, go BACK to Accessibility and select Switch Control. You will see that Auto Scanning is already set to ON. (Leave it that way.) Under Timing, select Auto Scanning Time and click the + button until it reads “2 seconds.” This will slow down the scanning time and make it easier to learn how to use the feature; this setting can be adjusted as needed to make the scanning process move more quickly or more slowly as needed. One thing that I have found to be important in this set-up process is making sure you (or the user) know how to turn the switch-control feature off and on easily. When Switch Control is turned on in Settings, switch access can be deactivated with a triple-click of the Home button (the round center button at the bottom of the front of the device). It’s also important to note that the feature can be activated through triple clicking the Home button as well, once you have set it up in Settings: From the Accessibility menu, select Accessibility Shortcut (at the bottom) and select Switch Control. You should see a check mark appear to the right of that command. Next, go back to Accessibility again and select Switch Control and then Switches from the menu. Now go back to the Home Screen and then triple click the Home button to activate the head movement switch access feature so that when you move your head to the RIGHT, the highlighted area will be changed to the next section or item on the screen, and when you move your head to the LEFT, the current item will be selected. I will warn you that even semi-smooth operation of this feature takes some trial-and-error type of practice. It only takes a slight head movement, as if you are quickly glancing to one side or the other. It’s also important to note that the lighting in the room must be at least fairly good and the iPad must be positioned so that it is held in a vertical plane with the Home button at the bottom, with the dot at the top of the screen (the camera lens) at a distance of about 15 inches from the face of the user. You will know that the device is in “switch access” mode by the bright blue lines on the far left and right sides of the screen. If you want to turn off the voice, triple click the Home button and go back to Settings >> General >> Accessibility and then click on Speak Selection to turn that to OFF. This is a very cool feature that requires no extra accessories except for possibly a stand or mounting system for the iPad. 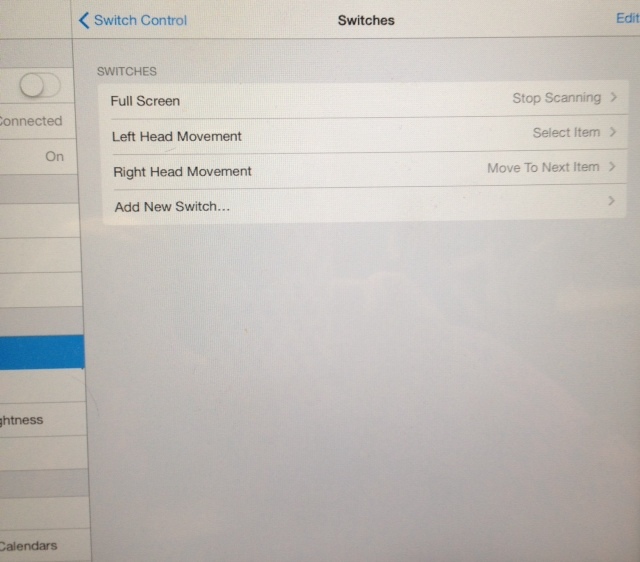 If you know a device user that may benefit from switch scanning access with head movement, I recommend that you give it a try prior to beginning instruction of the set-up with the user.